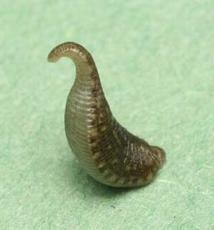 A broad and flat leech (to 27 mm), usually brownish in colour patterned with rows of greenish spots. Preferring running streams, especially those with a high calcium content. It attaches to the underside of stones. 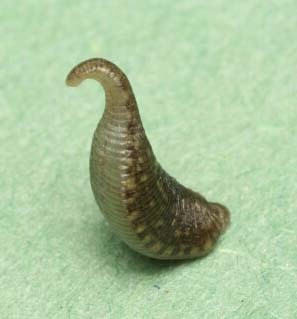 It is armed with a proboscis which it inserts into the soft parts of invertebrates such as snails, sucking out their body fluids. The adults brood their young. Poorly recorded but thought to be quite common in Britain.